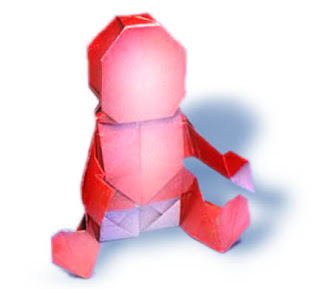 "I can't move, I can't speak, I need help..."
An origami design is used to express Orlando-Pelletier’s Nursing Theory. The three large folds represents the three steps or processes of patient behavior, nurse reaction, and nurse action. Subsequent smaller folds would include the assumptions associated with the theory. The finished object might resemble a silhouette of two people connected to one another, alluding to the ongoing nurse and client interaction required for deliberative care to effectively take place. Ida Jean Orlando, a first-generation American of Italian descent was born in 1926. She received her nursing diploma from New York Medical College, Lower Fifth Avenue Hospital, School of Nursing, her BS in public health nursing from St. John's University, Brooklyn, NY, and her MA in mental health nursing from Teachers College, Columbia University, New York. Orlando was an Associate Professor at Yale School of Nursing where she was Director of the Graduate Program in Mental Health Psychiatric Nursing. While at Yale she was project investigator of a National Institute of Mental Health grant entitled: Integration of Mental Health Concepts in a Basic Nursing Curriculum. 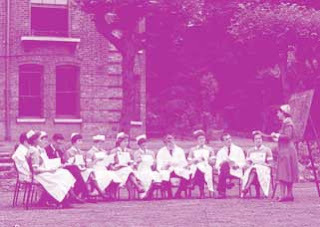 It was from this research that Orlando developed her theory which was published in her 1961 book, The Dynamic Nurse-Patient Relationship. She furthered the development of her theory when at McLean Hospital in Belmont, MA as Director of a Research Project: Two Systems of Nursing in a Psychiatric Hospital. The results of this research are contained in her 1972 book titled: The Discipline and Teaching of Nursing Processs. Orlando held various positions in the Boston area, was a board member of Harvard Community Health Plan, and served as both a national and international consultant. She is a frequent lecturer and conducted numerous seminars on nursing process. She is married to RobertPelletier and lives in the Boston area. She passed away on November 28 , 2007. The focus of Orlando’s paradigm hubs the context of a dynamic nurse-patient phenomenon constructively realized through highlighting the key concepts such as : Patient Behavior, Nurse Reaction , Nurse Action. 1. The nursing process is set in motion by the Patient Behavior. All patient behavior, verbal ( a patient’s use of language ) or non-verbal ( includes physiological symptoms, motor activity, and nonverbal communication) , no matter how insignificant, must be considered an expression of a need for help and needs to be validated . If a patient’s behavior does not effectively assessed by the nurse then a major problem in giving care would rise leading to a nurse-patient relationship failure. Overtime . the more it is difficult to establish rapport to the patient once behavior is not determined. Communicating effectively is vital to achieve patient’s cooperation in achieving health. 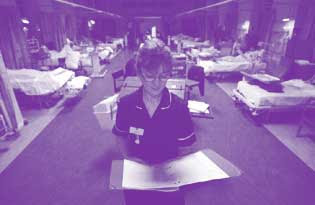 The nurse perceives behavior through any of the senses -> The perception leads to automatic thought -> The thought produces an automatic feeling ->The nurse shares reactions with the patient to ascertain whether perceptions are accurate or inaccurate -> The nurse consciously deliberates about personal reactions and patient input in order to produce professional deliberative actions based on mindful assessment rather than automatic reactions. Remember : Exploration with the patient helps validate the patient’s behavior. 3. Critically considering one or two ways in implementing Nurse Action. When providing care, nursing action can be done either automatic or deliberative. Automatic reactions stem from nursing behaviors that are performed to satisfy a directive other than the patient’s need for help. For example, the nurse who gives a sleeping pill to a patient every evening because it is ordered by the physician, without first discussing the need for the medication with the patient, is engaging in automatic, non-deliberative behavior. This is because the reason for giving the pill has more to do with following medical orders (automatically) than with the patient’s immediate expressed need for help. Deliberative reaction is a “disciplined professional response” It can be argued that all nursing actions are meant to help the client and should be considered deliberative. However, correct identification of actions from the nurse’s assessment should be determined to achieve reciprocal help between nurse and patient’s health. The following criterias should be considered. Deliberative actions result from the correct identification of patient needs by validation of the nurses’s reaction to patient behavior. The nurse explores the meaning of the action with the patient and its relevance to meeting his need. The nurse validates the action’s effectiveness immediately after compelling it. The nurse is free of stimuli unrelated to the patient’s need (when action is taken). Remember : for an action to have been truly deliberative, it must undergo reflective evaluation to determine if the action helped the client by addressing the need as determined by the nurse and the client in the immediate situation. Human/Person An individual in need. Unique individual behaving verbally or nonverbally. Assumption is that individuals are at times able to meet their own needs and at other times unable to do so. Environment Orlando assumes it as a nursing situation that occurs when there is a nurse-patient contact and that both nurse and patient perceive, think, feel and act in the immediate situation. any aspect of the environment, even though its designed for therapeutic and helpful purposes, can cause the patient to become distressed. She stressed out that when a nurse observes a patient behavior, it should be perceived as a signal of distress. Nursing A distinct profession "Providing direct assistance to individuals in whatever setting they are found for he purpose of avoiding, relieving, diminishing, or curing the individual's sense of helplessness" (Orlando, 1972, p. 22). Professional nursing is conceptualized as finding out and meeting the client’s immediate need for help. In a Veterans Administration (VA) ambulatory psychiatric pr actice in Providence, RI Shea, McBride, Gavin, and Bauer (1987) used Orlando’s theoretical model with patients having a bipolar disorder.Their research results indicate that there were: higher patient retention, reduction of emergency services, decreased hospital stay, and increased satisfaction. They recommended its use throughout the VA system.Currently Orlando’s model is being used in a multi-million dollar research study of patients with a bipolar disorder at 12 sites in the VA system (McBride, Telephone interview, July, 2000). McBride and colleagues continue its use in practice and research at the Veteran Administration Hospital in Providence, RI. In a pilot study, Potter and Bockenhauer (2000) found positive results after implementing Orlando’s theory. These included:positive, patient-centered outcomes, a model for staff to use to approach patients, and a decrease in patient’s immediate distress. The study provides variable measurements that might be used in other research studies. Orlando's theory has a continuing influence on nursing education. Through e-mail communication it was found that the Midwestern State University in Wichita Falls, Texas, is using Orlando's theory for teaching entering nursing students. According to Greene (e-mail communication, June, 2000) she became aware, when taking a doctoral course about nursing theories, that it was Orlando theory used by its school. Through networking the author found that for over 10 years South Dakota State University in Brookings, SD has been using Haggerty’s (1985) description of the communication based on Orlando’s theory for entering nursing students as well as re-enforcing it in their junior year (e-mail communication, (J. Fjelland, June, 2000). Joyce Fjelland, MS, RN. After working with Schmieding at Boston City Hospital, Lois Haggerty used Orlando’s theory in her teaching of students and in conducting a research study of students’ responses to distressed patients at BostonCollege in Chestnut Hill, Massachusetts. A relative of a patient at the emergency room went to the nurse’s station and began complaining in a loud shouting voice that their patient being a charity case is not being given the same quality of care as that of the other patients who are under private consultants. He claimed that their patient who was hyperventilating and was complanining of difficulty of breathing due to neurocirculatory astheinia was just forced to sit in the cubicle, while the rich-looking patient was a gomey. How will you handle this kind of situation and avoid conflict? How can Orlando’s dynamic nurse-patient interaction theory be utilized in this type of situation? in Partial Fulfillment of the Requirements in N207. We would like to acknowledge the following people: Ma’am Shiela Bonito, for coming up with this group work which really challenged not only our knowledge, understanding and creativity but also our ability to stay connected despite the distance, Ms. Aux Lizares, for diligently sorting out the articles, Ms. Maria Mae Juanich, for organizing the articles into a working blog, and for Ms. Katrina Anne Limos, Mr. Gino Paulo Maglaya, and Ms. Diana Jasmin Lee, for tirelessly contributing their thoughts, ideas, and resources. Without all of you, this blog would have never been possible. Thank you very much!!! Let us learn together. Have we done justice to Ida J. Orlando in presenting her theory this way? We would like to invite you to share with us your thoughts, feelings, comments or reactions on our blog entitled, “Understanding Ida Jean Orlando-Pelletier’sDynamic Nurse-Patient Relationship.” Thank you for your participation! Orlando, I. J. (1972). The discipline and teaching of nursing process: An evaluative study. New York: G. P. Putnam. George, J.B. (2002). Nursing Process Discipline: Ida Jean Orlando. In George, J.B. (Ed.). Nursing Theories: the Base for professional nursing practice (5th Ed.). Upper Saddle River, New Jersey: Prentice Hall, pp. 189-208. Schmieding, N.J. (2002). Ida Jean Orlando (Pelletier): Nursing Process Theory. In Tomey, A.M., & Alligood, M.R.. Nurse theorists and their work (5th Ed.). St. Louis: Mosby, pp. 399-417. Haggerty, L.A. (1985). A theoretical model for developing students’ communication skills. Journal of Nursing Education, 24(7), 296-298. Haggerty, L.A. (1987). An analysis of senior nursing students’ immediate responses to distressed patients.. Journal of Advanced Nursing, 12, 451-461. Wow a very factual presentation. The applications of the theory are very realistic. I also like the coordination of the colors. Congratulations to your group the explanation of the theory of Orlando is very precise and specific. That was very informative. I am writing from Canada. I am in my 4th year of Nursing School and am doing a presentation on Orlando. I enjoyed especially your clinical cases. Thank you! BSN student in Illinois doing a presentatin on Ida and I used alot of your information. Can I have permission to utilize and or recreate your charts of your interpretation of Orlando's theory for my Master's project? Very creative and informative blog. Enjoyed it immensely. I am a BSN student from Florida, currently studying nursing theories and models and it helped me understand the orlando's theory well. I loved the analogy of the oragami. my name is maria mae juanich (mayang) and i am one of those who put the ideas together from all the referrences. i appreciate seeing all your comments... i am a lil sad that it took a while for me to look back and see that you have wonderful comments. thanks a lot! @gavynus: i know it is late to say this but yes you may... the referrences were listed at the bottom of the article. For what its worth I worked with Ida At Metropolitan state hospital in the 1980"s . I recieved weekly supervision from her in regards to my clinical practice.She was instrumental in my decision to go to nursing school. I did not here of her passing as I was deployed with a combat support hospital in Mosul iraq at the time. Her impact on nursing remains.I believe Her patient focused approach approach is a forerunner of the psycho social rehab model that is in fashion at the moment. This was well researched I especially like the fact that you took the existing information and made it you own. Well done. It was a good source for my own class presentation. Your blog is very informative and creative. Especially your clinical cases. Thank you very much for discuss about this blog. To know more information about Limo Orlando visit us. Thanks so much for sharing. I get relavant information from your post.